Vivian Mary Hartley, later kent as Vivien Leigh (5 November 1913 – 8 Julie 1967), wis an Inglis stage an film actress. She won twa Academy Awairds for Best Actress for her performances as "Soothren belle" Scarlett O'Hara in Gone with the Wind (1939) an Blanche DuBois in the film version o A Streetcar Named Desire (1951), a role she haed an aa played on stage in Lunnon's West End in 1949. 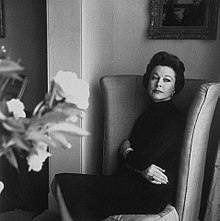 ↑ "Vivien Leigh on being English, portraying Americans." Daily Mail (online), 3 November 2013. Retrieved: 3 February 2015. This page wis last eeditit on 2 Julie 2015, at 00:33.